n 1911, at the inaugural banquet of the American Aeronautical Society in New York City the attendees – Walcott among them – earnestly discussed creating a “central aerodynamics laboratory” with a board of advisors to direct the research in this emerging technology. European nations already had similar organizations such as Britain’s Advisory Committee for Aeronautics and France’s Central Establishment for Military Aeronautics. Proposals were floated in the press and before members of Congress with the U.S. Navy, Massachusetts Institute of Technology, Bureau of Standards, and the Smithsonian all vying for control of the proposed institution. Outgoing President Taft established a committee to study the matter in 1912, but its efforts came to nothing. 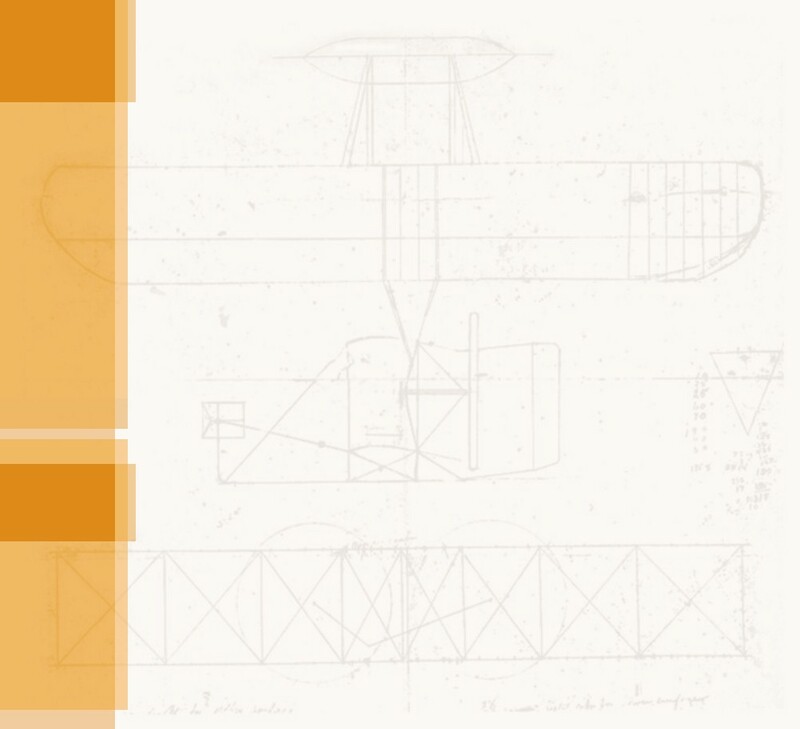 On May 6 – “Langley Day,” according to a decree by the Smithsonian – Glenn Curtiss was awarded the Langley Medal. This time Alexander Graham Bell gave a speech that actually mentioned the accomplishments of the recipient, although Walcott used the same occasion to unveil a bronze tablet at the Castle that lionized Langley’s contributions to aeronautics. Specifically, it immortalized Langley's discovery of the "relations of speed and angles of inclination to the lifting power of surfaces moving in the air." While Langley had done research in this area, the effect was actually discovered by a French artillery officer, Col. Du Chemin, in 1829. On May 23 of that year, Walcott convened a committee to direct the workshop, calling it the “Advisory Committee of the Langley Aerodynamical Laboratory.” Walcott was the president, Zahm was the recorder, and the rest of the committee was peopled with high-profile names in aviation, among them Orville Wright and Glenn Curtiss. All of this was bold politics. By reopening the workshop and creating a capable governing body, Walcott told Congress in effect, “Why create a new national laboratory for aerodynamics when we’ve already got one up and running?” The Langley Medal and the commemorative tablet emphasized Langley’s successes. Even Langley Day (May 6) was calculated to draw focus away from the failure of the 1903 Aerodrome A – 6 May 1896 was the date that Langley made his first successful flights with unmanned aerodromes. But it didn’t work. Walcott’s opponents found an obscure law passed a few years earlier that prevented executive agencies such as the Smithsonian “from requesting the heads of departments to permit members of their respective departments to meet at the Institution and serve on an advisory committee.” They used this to force Walcott to disband his Advisory Committee. 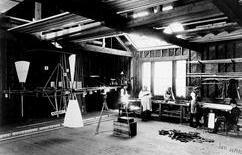 Although Langley's workshop remained open, it no longer had the political status afforded by the famous and well-placed advisors. Letter to the Editor -- Griffith Brewer writes the editor of Nature magazine about the inscription on the Langley tablet. 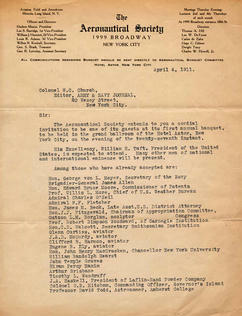 An invitation to the 1911 Aeronautical Society banquet. This was a big deal, as evidenced by the guest list. 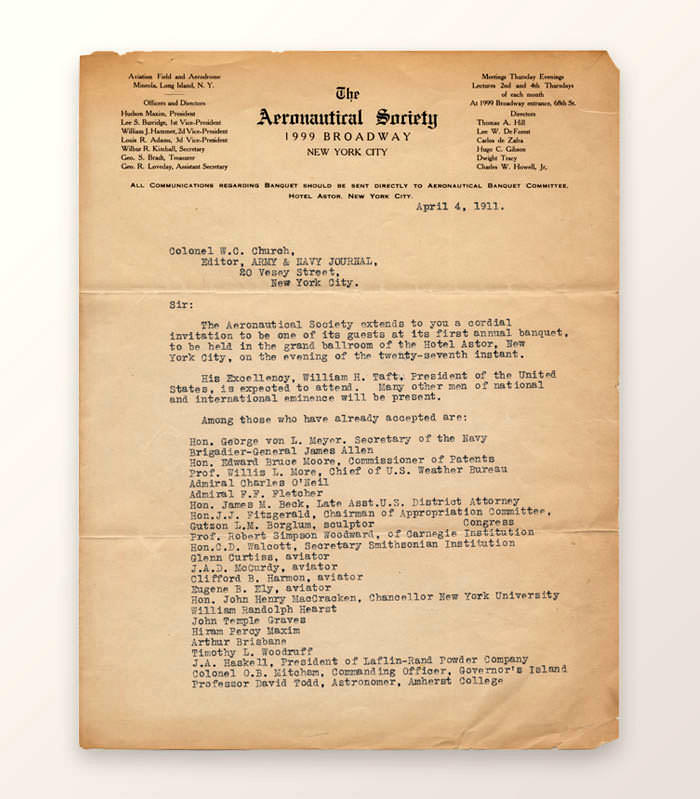 The Society was an off-shoot of the Aero Club of America, having organized in 1908 for the purpose of promoting and advancing the science of aeronautics. The formation of a national laboratory was high on their agenda. 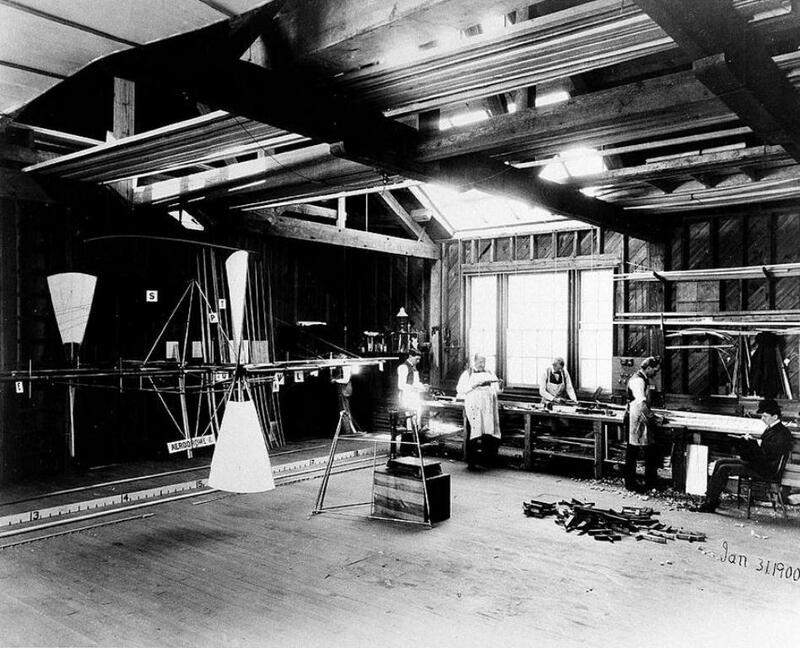 Langley's workshop in the South Shed of the Smithsonian, circa 1900. 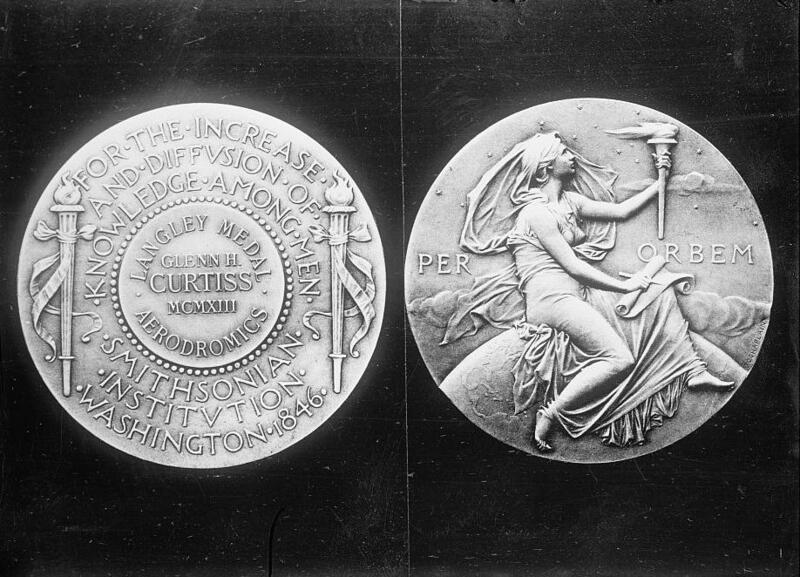 The Langley Medal that was awarded to Glenn Curtiss. 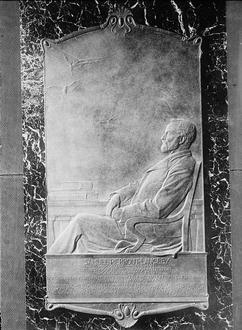 The Langley Tablet unveiled at the Smithsonian in 1913.